Articles about health, nutrition, and veterinary care. Adding happiness, one hedgehog at a time! 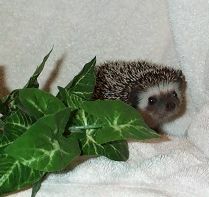 We are USDA licensed and have been raising quality African Pygmy Hedgehogs since 1995! We have dedicated our program to learning from, teaching about, and improving the quality of our hedgehogs. We have focused on health and temperament in our breeding program. We have seen huge improvement in both overall friendliness and longevity in our herd!! When you buy a hedgehog from Hedgehog Valley, your hedgehog is backed by the more than 20 years of hands on experience that Tig has in hedgehog husbandry that she will put to work for you. We are happy to answer questions before and after you purchase your hedgehog. Our hedgehogs are raised in our large family with both dogs and cats. They have enjoyed being handled and are used to normal household sounds, which is very helpful if you have kids and pets! We are excited to share our love for hedgehogs with you! Our hedgehogs have had the honor of being featured around the country in zoos and educational programs like the Memphis Zoo, Boston Museum of Science, Red River Zoo, Phoenix Zoo, Wonders of Wildlife National Wildlife Museum, Grant's Farm, and the Rolling Hills Zoo. We are passionate about our hedgehogs and we hope that the information in our pages will help spark your enthusiasm, too! If you've done your research and you're ready to add a hedgehog to your family, please click here to see our available babies! for expert advice on hedgehog care. My name is Antigone (Tig) Means, and my family (kids Seph, Binni, Zury, Trevelle, Jiejie, Ta'Kaya, Rain, Eryx, and Phoenix) and I are the humans behind Hedgehog Valley. We have participated in the hedgehog community in a variety of ways over the years, including educational programs, classroom visits, pet expos, and hedgehog shows. Welcome to Hedgehog Valley!